Preheat oven to 350 degrees. Line an 18 by 13-inch baking sheet with parchment paper. In a small bowl whisk together sugar and cinnamon, set aside. In a medium mixing bowl vigorously whisk together milk, eggs, vanilla and salt until very well blended. Cut each slice of bread into even three strips (you can layer a few slices to cut several at a time). Dip each portion (I usually dip 2 sticks at a time) into egg mixture then lift and let excess run off and transfer to prepared baking sheet (they will have to fit closely together but leave just a little space between them). 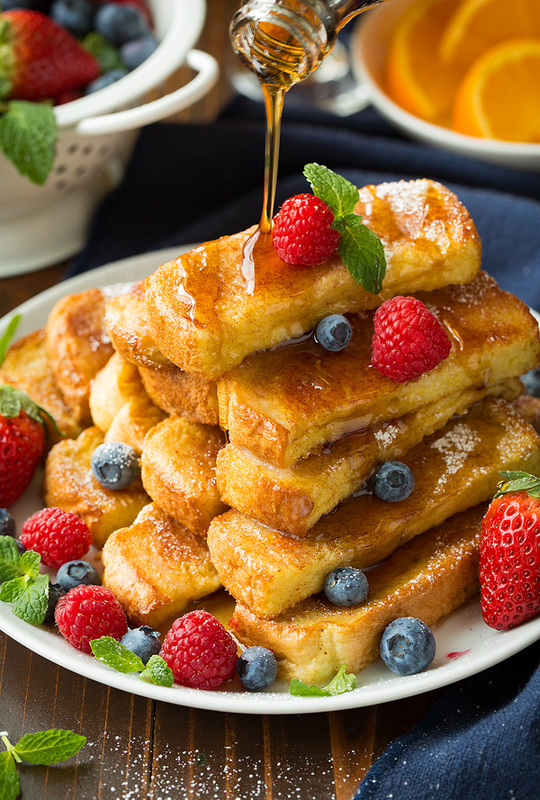 Using a basting brush, brush tops of french toast sticks lightly with 1 Tbsp of the melted butter. Sprinkle tops evenly with half of the cinnamon sugar mixture. Bake in preheated oven for 13 minutes. Remove from oven, flip french toast sticks to opposite side and brush tops lightly with remaining 1 Tbsp melted butter and sprinkle evenly with remaining cinnamon sugar mixture. Return to oven and continue to bake until cooked through, about 13 - 18 minutes longer. Let cool for a few minutes. Brush lightly with a little more melted butter if desired and serve warm with maple syrup for dipping.